Are you currently in the automotive industry and looking for a new opportunity to sell one of the leading automotive software solutions on the market today? The Autoxloo Dealer Marketing Platform offers a diverse line of products and managed services providing our representatives with the confidence they need to close more deals. We offer an attractive commission structure that combines both residual and one time payment for self motivated and entrepreneurial mindset individuals. If you would like more information about how to become an Agent or VAR please call 087-550-3995. We seldom see DMS providers offer a white label program, mostly due to their limited range of features, functionality and often the lack of connectivity to online classified or listing services, no recognizable SEO and no support to speak of. They fall short in much of the needed adjunct modules to bring the dealership a complete one stop shopping experience. Established and a recognized brand name. Autoxloo is a recognized as one of the leading DMS providers in North America, South America, Africa’s, and many other worldwide countries. There are industry professionals with existing footprint in the automotive online sales segment. An Agent is sales oriented and a closer with a strong work ethic currently work in or has a strong knowledge of the automotive industry specifically in the area of car dealership operations, automotive Internet marketing, Dealer Management Systems, Inventory Management Systems or Customer Relationship Management (CRM) solutions. As an Agent of Autoxloo you agree to sell exclusively the Autoxloo products and service within a specified territory to develop and grow the customer base. To ensure your success Autoxloo provides all Agents support in advertising and marketing content. You will have a supported website integrated with Autoxloo main site GEO targeting the territory assigned. Agents are eligible to attend national tradeshows in promoting the Autoxloo brand and furthermore are included in the national mass-Email and marketing campaigns initiated by Autoxloo in showcasing products and services to both new and existing clientele. As an agent all billing and commissions will be managed by Autoxloo billing department with the clients directly and is seamlessly to you. Our VAR program was developed for those individuals or companies successfully servicing the automotive industry, looking for complement and expand their product and services offerings by integrating technology, services and innovation to their existing services. 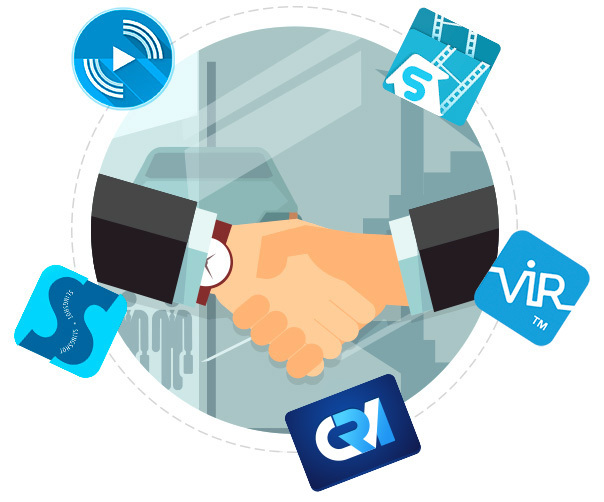 As a VAR (Value Added Reseller) you will have the opportunity to promote and or bundle any product or service Autoxloo offers with your existing business model. Ideal for SEO experts, Lending and Financing entities, photo taking services, data management, Lead Conversion and Business Development Consultants in need of a robust and effective platform to promote their services into the dealerships. Having access to so many products and services ensures that you will always have something to offer your clients to keep them engaged while creating new revenue streams. A Representative (Rep) of the Autoxloo DMS has actively and successfully served as an Agent for one year or VAR for two years thereby making the individual or company eligible in becoming a “Rep” and given the opportunity to manage up to four Agents of your own in an exclusive territory or State. As a Rep you will receive performance based incentives, recurring revenues, commission overrides and a dedicated staff assigned to help with all advertising, marketing and training. Choose which program you would like to receive more information.